What progress have neighbourhood plans in Kent and Medway made since the introduction of the Localism Act 2011 that shifted planning powers from central and local government to communities, and what can be done to support the neighbourhood planning process locally? This was the focus of the Kent and Medway Neighbourhood Planning Summit. 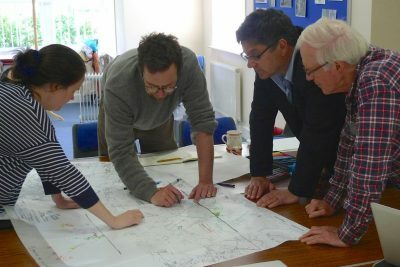 Over forty people attended the event from the Parish Councils, developers, planners, and consultants to participate in an event that captured the barriers and opportunities of neighbourhood development plans as a tool for shaping future change and growth. Chris Lamb (Director, Design South East and Chair of the Summit) opened the event emphasising the intention of the Summit to provide an opportunity to share knowledge and ideas, as well as create new collaborations and contacts. Chris introduced the first session, Kent and Medway Neighbourhood Plans. The first speaker, Jeanne Taylor (Partner, Lee Evans Partnership) represented the perspective of the landowners in the Faversham Creek Neighbourhood Development Plan (NDP) in Swale Borough Council. Her key message was ‘this neighbourhood plan process was very complicated’. Jeanne set out a timeline starting from 2006 until today in which the Faversham Creek area has been subject to changing planning policies in the context of changing Local Plans. The area was initially designated as an Area Action Plan and then became a Neighbourhood Development Plan in 2011 with shifts in policy emphasis from employment to introduce residential uses. In today’s context, the vision for Faversham Creek Neighbourhood Plan is to maintain and enhance the Creekside character in the emerging local plan. Jeanne also highlighted the complexity of the consultation process across this period of time. Interest groups have been most engaged, but Jeanne felt residents of the town as a whole, have not been greatly involved. Historic England made late representations to the plan, delaying it further. The Town Council selected their own examiner who is currently determining whether the Faversham Creek NDP meets basic conditions including meeting strategic policies in the Local Plan. The Examiner’s report is due out and will determine the next steps; to take the Plan to referendum or potentially revision and further consultation. The next presentation was a double-act between the local authority and the Parish. Simon Cole (Planning Policy Manager, Ashford Borough Council) stated neighbourhood planning didn’t have to be complicated. The important issue was to find a way to work together to have a good result. By managing expectations and being very clear on the purpose of the plan, the best plan would meet the basic conditions. Simon identified six practical questions to make a good plan: What issues will the NDP cover? Is the NDP the right tool for the job? What does the existing Local Development Plan say? Where is the Local Plan in the review cycle? What can be legally justified through Section 106, for example? What does permitted development allow? These questions are aimed to keep the plan-making focused. In his experience, the relationship between the local authority and the qualifying body is one of support and establishing regular meetings. The local authority can offer advice on what is the most appropriate method of consultation and in drafting policy. What is equally important, is what is the project management approach of the qualifying body (community) and how are they setting themselves up to include a breadth of skills and professions. At this stage, Simon handed over to Keith Brennan (Chair, Bethersden Parish Council, Ashford). Keith structured his presentation to discuss why, how and what has been behind the making of Bethersden Neighbourhood Plan. Keith demonstrated a strong local commitment to update the Parish Plan and allow community involvement in shaping the future of the area, particularly with the perceived threat and pressures on services of the recently approved 6000 homes at Chilmington New Town. The success of the process has been the formation of working groups to take forward three core themes for their plan; Housing and Primary Care; Recreation; Local Economy and Transport. In organising themselves in this way, Keith showed how it has focused local people’s minds throughout the consultation process. At the workshops, residents chose which of the three themes they wanted to contribute to. The agreed vision for Bethersden is to continue to thrive meeting the changing needs of the community whilst preserving the distinctive character, landscape, and setting of the Parish that evolved over nine centuries. For the preferred sites, sketch layouts have been produced that allows people to comment on the layout, style and density of proposed development in line with the vision. In conclusion, Keith offered some lessons of which he warned against vested interests and the difficulty to please everyone. His advice was stay focused on the agreed vision and attainable objectives and policies. Paul Winchester (Chair of Stone Neighbourhood Plan, Dartford) spoke next. He opened his talk by stating ‘a pre-requisite for making a neighbourhood plan is it has to be a cause worth fighting for’. It is a demanding and time-consuming process and requires that level of commitment, goodwill and trust. It has been a steep learning curve in understanding local government and the world of planning. Some of the challenges have been making a plan in close proximity to Blue Water shopping Centre, the Dartford Crossing, the old chalk pits in-filled with household waste. Other challenges related to the plan itself has been in proposing commercially viable development and engaging with the silent majority. Initially, the consultation strategy was to invite people to public events but the turnout was poor. The new strategy is to go out to residents and community groups and engage with them directly. Paul ended with a wish for the neighbourhood planning process to be positive, collaborative and imaginative. The final speaker in the session was Cllr Julia Newman (Chair, Hawkhurst Neighbourhood Development Plan, Tunbridge Wells) who began by outlining the steps taken in project managing their plan. They recognised they needed expert help and recommend that all groups ask themselves that question at the start. Hawkhurst employed a consultancy to help with the process which included budgeting, monitoring, identifying issues that matter, identifying and engaging with stakeholders, and forming a working NDP committee/group. A fast visioning exercise was one of most successful ways of engaging with local residents early on. Set up as a series of focus tables, groups would move around to add their views to each theme. To keep the momentum going, six weeks later a 3-day design workshop was held. It proved very popular with over 170 people attending. Further opportunities to maintain engagement have been created included surveys (off- and online) and midday-to-midday drop-ins including a brief progress presentation every hour. The lessons learned from the experience of making the plan is the importance of having a champion, a budget, early engagement, expert help, avoiding “scope creep” and most importantly, enthusiasm! The Session ended with a 20-minute buzz group activity led by Noha Nasser. The audience were split into groups of three and asked to spend 8 minutes discussing the barriers and opportunities to neighbourhood planning based on their own experience and after hearing from speakers. The ideas were collected and each speaker selected one or two of the ideas to reflect on. The second session began with Christopher Mountain (Neighbourhood Planning, DCLG) setting the context for the next steps for neighbourhood planning. His key message was that government likes neighbourhood planning, and from all sides of the political spectrum. In the current government manifesto a pledge was made to communities to assist more of them to draw up their plans. Christopher presented some key statistics: 1700 communities are neighbourhood planning, 375 draft neighbourhood plans, 69% of councils are making neighbourhood plans, and there have been 118 successful referendums. Christopher pointed out there is still work to do to promote neighbourhood planning to a third of councils. He also pointed out with referendums just getting through on a 77% Yes Vote, communities are worried of the ramifications on neighbourly relations in the future. Nonetheless, every single referendum has been successful. The top 5 policies in emerging neighbourhood plans are: promoting local distinctiveness; parking standards; pedestrian and cycle routes; scale, height and density of new developments; and affordable housing. To support communities making plans, the DCLG has produced a single site for resources, tools and templates at thinglink.com. Christopher presented the changes to the Housing and Planning Bill, stating that it aims to simplify and speed up the process by placing new time periods for local authority decision-making but not community groups. The government is consulting on the new time period in January. The Bill will also give the Secretary of State power to intervene if the local authority and NDP group are in disagreement with the examiner. The biggest question right now is should local communities have the opportunity to allocate sites for small-scale Starter Home developments in their Green Belt through neighbourhood plans? Tony Burton (Free Range consultant) was up next to share his lessons learned from the first wave of neighbourhood development planning. His key message was ‘it is here to stay’. Tony gave a brief overview of the history of neighbourhood planning, and the rights and power shifts in communities taking control of the change in their areas. The emphasis for communities has been – where does the scope and scale of the plan add value? Tony explored the different ways in which neighbourhood forums have defined their boundaries from large cross-borough boundaries to the scale of the high street and its surroundings. Engagement was a key theme that had run through each presentation, and Tony took time to explain the benefits of engagement in recognising the capability people have to make a difference. There is a breadth of support for neighbourhood plans, financial and technical. Tony mentioned a few including mycommunity.org.uk. Tony was clear, there is still more that could be done such as obstructive councils, growing the number of neighbourhood plans from 1700 to 17,000, engaging developers and the big beasts, improving the support programme, communities engaging communities and equality for forums. Tony ended by calling neighbourhood planning a movement, a civic revolution and, it’s here to stay! Up next was Angela Koch (Director and Founder, ImaginePlaces). Her first point was that the reality of the Neighbourhood Planning process is not as linear as the roadmap of the neighbourhood planning process published by Locality suggests. She presented an alternative that include some more detail on significant stages, peaks and valleys which communities had to master on their sometimes demanding journey. She reiterated that the main motivation for communities is often forgotten but remains rather close to deliver actual change and improvements in their neighbourhood. Angela stressed that simply having a Neighbourhood Plan policy concerned with ‘good design’ does not necessarily deliver ‘good design’ and ‘good places’. Policies are often weak and limited in scope. An understanding of strong and weak place-making policies needs to be developed and applied appropriately to Neighbourhood Planning. Angela points out that words in policies such as ‘encouraged’ or ‘supported’ are weak. However, words like ‘must’ will support local planners, planning committees and land development teams much more clearly in the understanding what the majority of local people that voted yes in a referendum would like to see when it comes to place-making and design quality in their local area. Further and in recognition of the distance between policy making, policy application in the pre-application process and delivery of change, Angela highly recommends to insert in every Neighbourhood Plan strong pre-application process policies related to the development of development/design briefs/design codes allowing for collaborative working between all involved and affected. She found independently facilitated Design workshops/charettes/ Enquiry by Design have proven exceptionally effective in this regard. Angela encouraged all the communities present to pick up the phone and meet with peer-communities taking an active role in shaping the look and feel of their neighbourhoods in the pre-application process (e.g. Ascot, Sunninghill and Sunningdale Neighbourhood Plan, p. 32; www.lookstalbans.org). Angela left the audience with 5 top tips; embrace the referendum and landowners; work with as many people as possible; understand and embrace volunteers; ask for help; more learning/training peer-to-peer. Jon Allen (Development Manager, Commercial Estates Group), gave a lively presentation on the large scale projects CEG have been involved in across the country contributing £3bn GVA to the UK economy. CEG considers itself a master placemaker that adds to communities. Jon’s key message was ‘creating a nice place to live, was commercially good news and good news for the community’. Extensive consultation is part of every CEG project. Working closely with Town Councils, CEG have found support for agreeing the right location for development and, as a result, not much opposition. CEG have found, however, that there are NIMBY attitudes with not much expertise on Parish/Town Councils. Competing development interests can seek to frustrate and confuse matters. Jon described cases, like in Thame neighbourhood Development Plan, where initial opposition to allocations was turned around through CEG’s engagement and working through the matters. In the case of Thame, there was increased pressure for Oxfordshire District Council to take on housing allocations. The District Council handed over responsibility for developing the neighbourhood plan and meeting the allocations by a fixed deadline. The Town Council encouraged engagement with the developers asking them ‘tell us what you want to do here?’ Jon ended by explaining the CEG approach is premised on the belief of extensive consultation. By collaborating, it is more time consuming, but it pays off in the end. For CEG, there is a greater certainty of delivery through collaboration. Jon encouraged communities to work with developers and to ensure time frames to deliver the plan are put in place and adhered to. The final presentation was Biljana Savic (Director, Academy of Urbanism) who started by making the point that the ‘plan was only the start of the process to implement on the ground’. She warned that after the referendum, enthusiasm wanes, and the importance to continue to engage with planning officers, councillors, applicants, and to influence the local authorities regular investment streams. Biljana encouraged the early engagement between developers and communities, conventionally known to not always get along (according to a Locality survey). Biljana encouraged communities to take on project delivery early on by incorporating themselves in governance models, owning assets through asset transfer rights, and to apply for funding. A number of case studies Biljana presented showed the scale of projects that communities have been leading including small scale temporary pop-up meanwhile spaces to converting redundant factories into visitor attractions. Her final message to communities was use your right to bid; build; and challenge – and don’t give up! The final Q&A session covered the role of the developer as a supporting stakeholder that can meet the objectives of the community. Another question sought to further understand the difference between consultation and engagement. Tony said consultation is a choice between A and B but engagement is asking ‘what do you want?’ Angela said the difference is that engagement is a learning experience compared to no learning in consultation. Jon stated that engagement is a two-way process where agreement/disagreement is possible compared to consultation where communities cannot question what is going ahead. Another comment was about maintaining enthusiasm throughout the process. Angela mentioned the importance of using the working group meetings to be opportunities for team building and small quick win projects like painting a bench. Final comments on the management of timescales. Tony reminded the audience that neighbourhood planning is fundamentally a project management exercise. Jon agreed and mentioned the success in Thame was the deadline set by the District Council to deliver the homes in a fixed period. Jon argued difficult decisions have to be made and it is pointless delaying them. Chris Lamb closed the Summit with the final remarks stressing the importance of local distinctiveness and engagement in the making and delivery of neighbourhood plans.